The Mid-west is known for many things, however reggae is not normally one of them…yet. 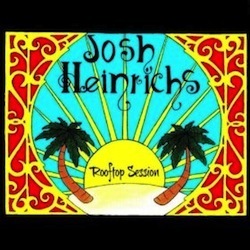 Josh Heinrichs brings his signature vocal style together with some wholesome roots reggae on his latest EP release titled “Rooftop Sessions”. The EP leads off with it’s title track, a light, upbeat roots track that feature’s Heinrich’s impressive vocal range almost immediately, coming in on a soothing high note. The backing track sounds extremely authentic, definitely no electronic beat making or fancy production gimmicks, it sounds as if you are kickin’ back in a garage listening to the band with a cold one in hand. The next track is a classic country song by Buck Owens that Heinrich injects a little island vibe into, revamping the tune “Crying Time” into something a little more irie. Heinrichs then gives the listeners another original, “Wrapped Up” to serve as the middle track and transition to the second half of the EP. Usually artists wouldn’t include two covers on a shorter EP like this, however Heinrichs’ acoustic version of Adele’s “Set Fire to the Rain” garnered not only massive attention on the internet, but also caught the eye of producer/artist Stick Figure. Together, the two collaborated on a full band version that launched directly into the upper echelon’s of the iTune’s charts. Heinrichs offers a soulful rendition on this particular EP, again stripping things down to just himself and his guitar to recapture that original sound and energy that inspired Stick Figure. This is easily one of my favorite acoustic tracks and I would like to think Adele herself would be impressed. Closing out the album Heinrichs decides to turn the energy up with some help from fellow artist and frequent collaborator Skillin Jah on the closing track of the album “Straight from Yard.” This track features a heavy back beat, some crunchy electric guitar, and of course Heinrich and Skillin Jah trading off on the vocals. The two voices compliment each other almost perfectly, Heinrichs’ sweet, soothing singing voice soars while Skillin Jah’s more Jamaican DeeJay style keeps the audience rooted in the track. In all this is a great release by Heinrichs, it shows he’s just as versatile in the studio as he is on stage. Expect to see some big things come out of the Mid-west from both him and his label Ganjah Records!